I grew up and live in taco truck city! Though taco trucks were not a common grab and go meal for our family food from one of the many taquerias on our side of town was. When I went veg in high school grabbing a veggie burrito with rice, whole beans and salsa was my go to. We even had DIY taco and burrito nights at home. My mom or dad would get a bunch of fillings in bowls and have a stack of tortillas ready to go for us to build our own. In junior high I took home economics. Our teacher taught us to make one meal a week. One of the foods I remember cooking for the first time was a dish with chorizo. We had Italian sausage at home but never we never had chorizo. I cook with soyrizo now - I know plenty of vegans and nonvegans who dig on the stuff, not only is it not full of gross animal bits but it it heart healthy. I wanted to create a meal for dinner that was comforting, had a throwback element and also something new so I turned to migas! 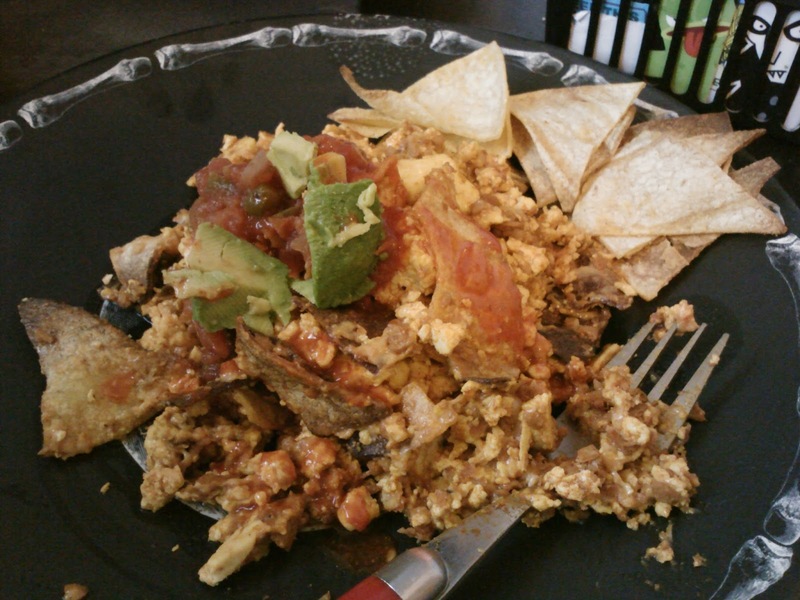 Migas is a toss together meal consisting of scrambled eggs, tortilla bits and what you have on hand. Since obtaining some black sea salt and finished The Fault in our Stars (Hazel made me want to cook a scramble outside of breakfast!) I wanted to create something with a tofu scramble as an element. I baked some corn tortillas cut into wedges with a bit of olive oil in the oven at 400 for about 15 minutes, turning them in the middle. I seasoned with pink sea salt when I took them out, pretty basic. My tofu scramble was a block of super firm, crumbled and cooked with olive oil, black sea salt, turmeric, garlic powder, black pepper, cayenne pepper and pink sea salt.Ten minutes into the game I threw in a 1/2 pack of soyrizo, cooked it for five minutes then a 1/2 bag of cheddar Daiya. I cooked everything till it became all gooey and melty. I thew in a handful of broken tortilla chips, plated it with more chips on the side, salsa and fresh organic avocados. We have a winner here! Comfort food that is simple, rather cheap (Daiya was buy one get one free last week at Sprouts) and you can use up leftovers! You can even swap out the soyrizo for black or pinto beans - making it even more affordable! I never tasted migas until about 15 years ago and was smitten. Great addition of black salt to get that eggy type taste mixed in. Another winner. How'd you like the book? Yum looks and sounds amazing!! If only Daiya was sold in my country!